I have been to many a martial arts grading over the years. I wince when I hear the same speeches over and over again. “The grading was good”. “I am pleased with your performance”. BORING…I look around and people are on their mobiles or snoozing. The instructor was at a loss for words, so just put out the usual stuff. Don’t let this happen at your grading. 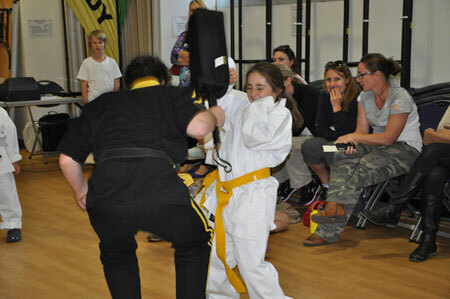 Let’s look at how we can be creative and make the speeches at your martial arts grading really pop. Let’s take this opportunity to inspire our students and help them improve for the next one. Here are some good themes to make your martial arts gradings the ones your students remember. This post was written with the martial arts instructor in mind. For students please see Kids Karate Grading: How to Pass. For another take on the subject of inspiration, have a look at How to Never Lose Motivation for Training Karate from Karate by Jesse. It’s a good read. One: The grading was good. Maybe it was, maybe not. But there must have been at least one or two things good about it. Find them. Say “the punches were lightning fast”, the “kicks were super explosive”, “the kata were extremely crisp”, “the stances were rock-solid”. Tell them exactly why the grading was good in your speeches. Two: Martial arts is an individual, not a team sport. So don’t compare yourself to your classmates. Some will learn fast, and some will learn slow. Fact of life. I am a slow learner, for example. 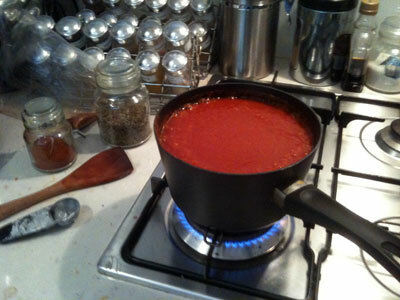 It takes me many hours of practice to get something down, while others may pick it up in a matter of minutes. But once I learn something I learn it well. Others will be more athletic than us. Fact of life. There will be some who are more explosive, others more flexible, others that have better timing, usually through experience. Compare yourself not to others, but to who you were yesterday. Three: Martial arts are a journey, not a destination. It can be a wonderful, life-long quest that will challenge you, but at the same time drive you to strengthen and harden your body, build immense willpower, eat clean, and live the healthy “martial arts” lifestyle. Don’t burn yourself out trying to rush through the belts to be the first in your class to reach black. It is not a sprint, it is a marathon, so take time to enjoy the journey. Relish knowing what your body can do and the fact that you now walk with confidence. Four: There will be setbacks, but never give up on your dreams. Injuries, job demands, family, school, they all get in the way from time to time. They are important, and demand your attention. But stay the course, and train when you can. During busy, stressful times, the martial arts will always be there to help you release your tension. Again, it is a marathon, not a sprint. Five: Embrace and enjoy the friendships. Life-long friendships will form out of the martial arts. Trust me on this. These people you meet will most likely be refreshingly different from your other friends. Be open to forming new friendships and go out of your way to be kind to everyone in the dojo. Reach out. Six: Be proud, but be humble. No one likes a braggart. Be very proud of your achievements, but keep it inside. The people who matter most will already know of your martial arts prowess. Seven: Make the new students feel welcome. We were all once shy, scared, un-coordinated white belts when we walked through the door. Maybe someone laughed at us when we fell or made the wrong moves in the kata. We were so humiliated we felt like quitting. Help build the beginners up, not tear them down. Have a kind word for them and let them know we all went through the same thing. Tell them after the martial arts grading that they did a good job. Respect all who have the courage to walk through the door to make that first step on their journey. Eight: Work on your strengths, but be aware of your weaknesses. For years my weakness was grappling. I took traditional Japanese Jujutsu classes years ago. 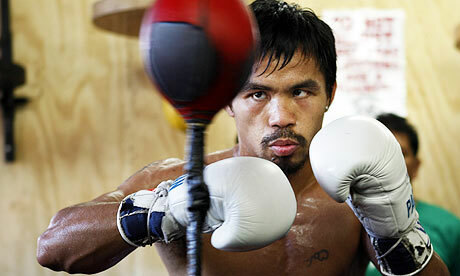 I could hold my own in the stand-up sparring, but smaller, weaker guys could take me down and dominate me on the ground. I learned very quickly it was not about strength, but technique that mattered. I am currently studying Brazilian Jiu-Jitsu, and the ground is now my friend. Discover your weaknesses and shore them up. Nine: Last but not least, thank your students and the parents for supporting your program, for without them, you would not be living this marvellous, healthy lifestyle. Let your heartfelt appreciation come out in your speeches. Instructors, what are some of the speeches you use to make your martial arts grading more interesting and inspiring? Students, what did your instructor say to you at the martial arts grading that inspired you the most? Children want and need structure. They must not be allowed to come and go as they please in a martial arts class. I was thinking the other day about some of the “disasters” that have occurred during our kids martial arts classes over the last eighteen years. Luckily I learned from these experiences, but would like to share them with you so you do not make the same mistakes. I asked my friend Didi Goodman, a very knowledgeable instructor, who also specialises in childrens martial arts classes, for some of her ideas as well. Didi and I don’t always agree on some issues so I thought it would be interesting to get her take on the subject. 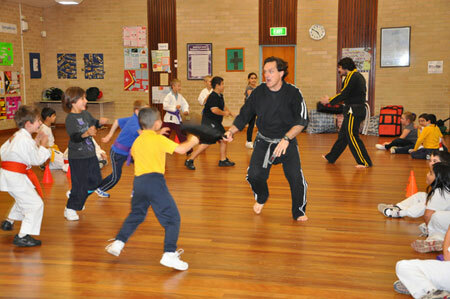 Here are my ideas on how not to run a martial arts class for children. The instructor needs to take control of the class. There have been a few times over the years when I was either very tired or distracted and gave the kids free rein. I realized very quickly that kids want and need structure. A few comments from the parents about the chaos that day were all I needed to get it sorted out. You cannot let kids come and go as they like. If everyone did it you would have no class! I let the kids join in without penalty if they are late, because it is rarely their fault as they do not drive. However, if they want to leave the class for any reason, they must ask permission. I never refuse to request to go to the toilet. However, if a particular child is constantly asking for a drink break or something, I will often say “No, you must wait until the next class break”. I do not permit this. It is extremely rude, and I will walk up to them while they are talking and stare at them until they get up and take their conversation outside. For the very stupid or careless ones, I will interrupt their conversation with “Can you take your mobile outside?” in a loud voice. Kids need to have a bit of fun. Our classes have been very popular over the years for two reasons: they are fun and affordable. Well, three reasons actually–they learn excellent martial arts skills! We play games, but all the games are designed to build skills like coordination, teamwork, footwork, and especially, concentration. Boring classes are empty classes. The first time an instructor is late people start to wonder if they really care about their students. The second time it happens their students start to quit. The third time….well, the instructor needs to find another job, they do not care enough about their career or their students to be a martial arts teacher. Didi Goodman, who also wrote the book entitled The Kids’ Karate Workbook, made the following additions to this post. I do push-ups if I’m late! LOL I know how you feel about push-ups. I think I’ve been late 3 or 4 times in twenty years. Once it was because my neighborhood was on fire. I missed the whole first class and was late to the second. Nothing wrong with being firm, clear, and demanding. Be as serious as you like. But you don’t need to be frightening. And if the kids think you’re angry with them whenever they make a mistake, your classes aren’t going to thrive. 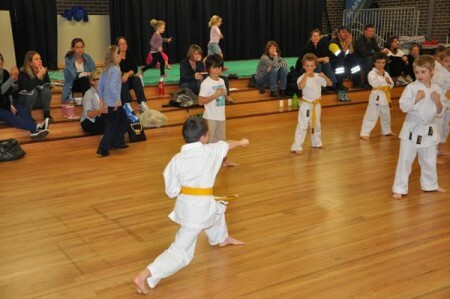 Be ready to laugh; let the kids know you enjoy martial arts, enjoy them and enjoy their efforts. Then they’ll enjoy trying their best for you. Lay that foundation and you can set the bar as high as you like. While we’re on the subject of etiquette for parents, sometimes they need encouragement to stay in charge of the siblings and toddlers who may accompany them to your school. Their noise and actions can be yet another distraction for your class, and when toddlers run onto the floor, it’s a safety hazard as well. A game now & then, even a warm-up game every class – no problem. Making a game of hard work, or disguising repetition – those are perfectly good teaching techniques. But the highest goal of an instructor is to get the kids to love working out, to love striving for improvement, – to love learning! Classes based solely on games too often breed students who feel entitled to play – and who resist good old-fashioned discipline and work. Everything doesn’t have to be a game. 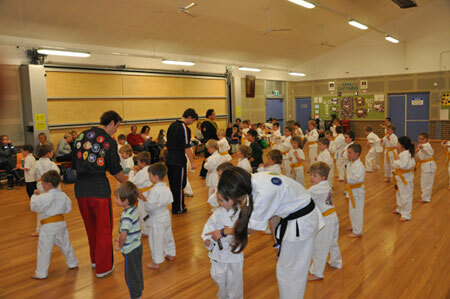 Help the kids discover that martial arts training is fun in and of itself. Thank you so much Didi for your ideas about How Not to Run a Martial Arts Class for Children. Your experiences parallel mine closely and it is interesting to see your take on it. Instructors, what ideas do you have on this subject? Martial Arts Instructors | Are You Ready to Go Pro? I have been asked many times in my career, how did you build a successful business as a martial arts instructor? 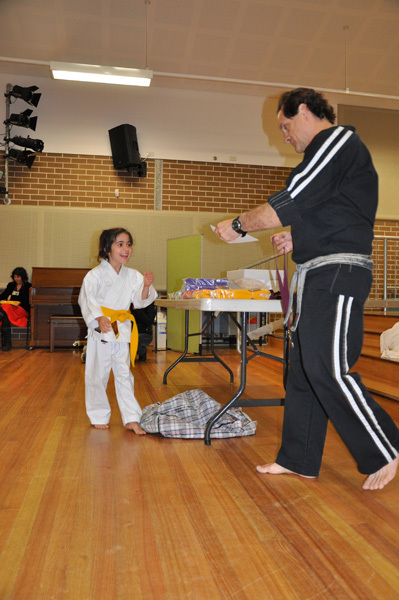 They see the results, our many kids martial arts locations in Sydney, but they do not see all the years of work and sacrifice that went into it. Many have asked me how to get into the martial arts business full-time. The person who is considering going professional and doing martial arts as a full-time career should ask themselves some important questions. Are you truly passionate about the martial arts? In your spare time do you spend hours looking at martial arts videos on YouTube trying to better your game? Do you spend a good percentage of your budget on martial arts DVD’s and gear? Do you absolutely love coaching martial arts and passing on your knowledge to the next generation? Passion will carry you through the inevitable tough times, and will attract people to your club. Are you organized? Running a martial arts club takes superb organizational skills, as there is an incredible amount of preparation involved in running the classes. Are you able to schedule your day and prioritize your tasks? If you are not organized, you will make mistakes, lose credibility, and finally, lose students. Are you willing to work harder than your competitors to make your business a success? I wore out a lot of shoe leather to build our organization in Sydney, particularly in the areas of marketing, student retention, and instructor development. There are times when I wake up and face a difficult day of something I’m not particularly fond of doing, while my friends are at the beach. But I relish hard work because I know my competitors are not going to keep up the pace. Are you motivated to stay healthy and fit? Will you continue to train hard in order to inspire your students? Will you eat right and get plenty of rest, so you can give your students your best? Are you able to build relationships and sell yourself? You will need to get out there and hustle, particularly when building your name in the community. You will need to attract people who will be keen to help you. Are you willing to admit that you do not have the skills in every area, and get the appropriate help? You will have strengths and weaknesses, and must know yourself well enough to find help in areas in which you are lacking. Most important, are you willing to put in the time to ensure your service is the best out there? Are you enough of a perfectionist to challenge the status quo and keep pushing it, but not so much of one that nothing gets done? Are you always in pursuit of knowledge about the martial arts? Are you continually trying to improve as an instructor? Do you have an open mind when it comes to new ways of doing things? If you answered yes to these questions, perhaps you should think about going pro in the martial arts business. For me, it has been the most rewarding of all careers. Martial arts instructors out there, do you have anything to add? How can being injured as a martial arts instructor be a positive thing? I found out recently when I broke my arm in three places in a karate tournament, requiring surgery and a plate in my arm to hold the bones together. Sometimes when life throws you a curve ball (or in this case a kick), you just need to go with the flow. I watched a lot of DVD’s, mostly about MMA, Brazilian Jiu-Jitsu, and bodyweight exercises, three of my current passions. Even though I was not able to do the vast majority of the moves, I visually went through them many times. In fact, when I was finally able to get back on the mat to roll, some of the techniques came back to me well enough to actually use. The energy that I would normally have put into training went into study. Being a left-hander, I believe it’s actually an advantage to break your right hand. Why? You learn how to use the other hand better, and more importantly, it uses the other side of the brain, effectively cross-training it. I am still practising writing with my right hand months later. I studied Chinese Calligraphy a few years back and found writing with the left hand difficult because of the “smudging effect” as you move your fingers across the page left to right. When my writing is good enough with the right hand, I am going to go back and give it a crack as a right-hander. 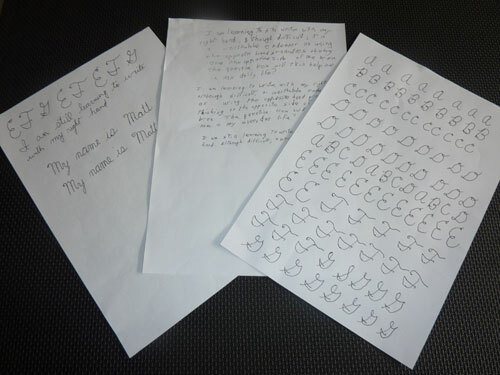 I had to teach myself how to write with my right hand, cross-training my brain. Needless to say, writing, shaving, and other activities with the right hand has resulted in better coordination on that side. As a martial artist for over half of my life, I was already somewhat ambidextrous, but this certainly helped build strength and coordination on what used to be my weak side. The body has a wisdom of its own. Did it want to get hurt seriously? Probably not, but since the break, and the resulting enforced rest, something mysterious happened. My sore shoulders, cracked rib, sore knee and every other ailment I had completely disappeared. The relative inactivity gave my whole body a long enough rest to recover, which would have been unlikely if I kept training at the same intensity as before the injury. I had to find some way to stay fit as I had already booked a trip to Rio to train with Royler Gracie, one of the best in the world in Brazilian Jiu-Jitsu. The doc said it would probably be ok to go if my arm healed well enough in the ten or so weeks I had left before the camp was to start. As I did my rehab exercises, I developed a program to practise Brazilian Jiu-Jitsu with one arm to get myself fit for the mat. As an injured martial arts instructor, you find new and interesting ways to keep fit. Other activities I tried were kettlebells, bodyweight exercises, and walking/running up and down stairs. 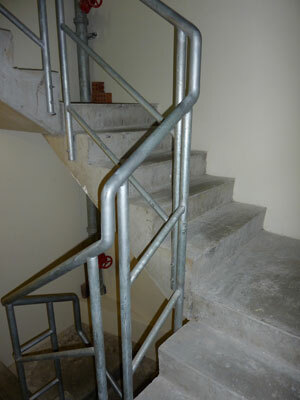 Luckily the apartment in which I live has three floors of stairs. I worked my way up to twenty trips up and down, and towards the end I was running. This was a great exercise to discover as I now use it when I don’t have the time to get to the gym and need a quick workout. Although I would not choose to go through this whole experience again, I found that by looking at the bright side of things, it was easier to stay motivated and keep on track in my training. What experiences can you share as an injured martial arts instructor or student? Abmar Barbosa is one of the world's best at Brazilian Jiu-Jitsu, and is also a fine teacher. Abmar Barbosa is one of the best Brazilian Jiu-Jitsu competitors in the world. He is known for being a bit out there on the edge with his technique. I would say that is putting it lightly. His DVD is known as Jiu-Jitsu Outlaw, because he likes to shake it up and do things differently. His seminar this Monday at Gracie Sydney started with one hell of a warm-up. Upside down, between our standing opponents legs, literally doing the plow pose from yoga while rolling around and through the legs. I struggled big time, and it didn’t help that the other white belt I was partnered with (though with three blue stripes) seemed to know what he was doing. Not only did I struggle with the technical details of the move, but also the flexibility required seemed to be out of my range of motion. I thought to myself at the start of the seminar, “I am in for one long night, this is way too hard”. I underestimated Abmar’s teaching ability. Breaking moves into the smallest details. Abmar worked his way around the room, and although the techniques were now part of his instinct, took the time to break them down for us in the smallest possible detail until we were able to understand and perform them. On one particular technique he had me copy the motions in parallel with him without an opponent until I was able to master it. Then I tried the move against my partner. It worked like a charm. Brilliant! Being aware when the students are struggling. The mark of a good instructor is he or she is sensitive enough to know when students need more assistance. He had us re-group many times to go over a technique with which we were having difficulty. He then broke it down into even smaller detail until we could grasp it. Knowing when to offer praise and encouragement. I perservered with the moves. After what seemed like eternity, I nailed one of the sweeps, just as Abmar walked by. He smiled and said, “You got it, no problem”, and put out his hand to give me the low five, as I was in a prone position. My heart rose up, and I was immediately filled with confidence. The rest of the seminar was challenging to say the least, but with my new sense of purpose, I pushed on and learned a great deal of material. Sensing I was having great difficulty with the movements, he waited until I did one right to offer his encouragement. It would not have meant anything if he had praised me for doing a move half-heartedly. Making the class challenging yet also drilling important skills without being boring. Each move, although complex, was built on the one before it. In this case, we worked the moves from the same spider guard over and over again. Although I had very little experience with the spider guard before the seminar, the constant drilling of it gave me a great start on this very important part of BJJ. Being passionate about the subject. Abmar was so wrapped up in the class, he went well past the time slated for the seminar. You could tell Brazilian Jiu-Jitsu is his life. As I performed each new technique the body somehow started to limber up and the movements started to become easier and more natural. I gained a new respect for the spider guard. As an instructor I came away with a great perspective on how to teach, from a great competitor, but also a fine teacher. Did I forget to mention, Abmar is only 27 years old? An experienced martial arts instructor can still teach, despite being injured. As a white belt in BJJ, I am dominated on the mat, plain and simple. Although I am learning to use technique more and strength less, I lack the experience of the higher-ranked students. As a beginner, I am much more susceptible to injury. The body is having a hard time adapting, at 52 years of age. Since I started training in BJJ in June, I have had two very sore rotator cuffs, a dislocated little toe, a stiff neck, and severely bruised ribs. This has not kept me from training consistently, but has slowed me down. I have used the downtime to look at my BJJ books, play BJJ DVD’s and create lesson plans for our MMA classes. I have been able to workshop many BJJ and MMA techniques with our senior students, despite being injured. When I get back on the mat to roll, I will have a better understanding of the intricacies of the moves. I have been able to continue my yoga classes and conditioning with our MMA students, so my mat fitness should remain okay, even without rolling. Every martial artist should have a backup plan for exercising in the event of injury. There is always something you can do to stay fit. Many athletes cross-train during the time it takes to recover from an injury. It is actually better for your body than doing the same exercises every day. Injuries have not prevented me from teaching. You can be bruised and battered, and yes, even old, but your knowledge and the ability to impart it to your students can never be taken from you. I taught classes for a year and a half as I recovered from a knee reconstruction, with the help of my able-bodied assistants. This gave them much-needed experience running the classes, while I was able to give them a critique on their teaching method. As a martial arts teacher, you are only expected to be able to teach your students the movements and help them to understand. You are not expected to be a physical specimen or jump over tall buildings in a single bound.